Just because the temperatures are cooler doesn’t mean you can’t enjoy being outdoors. While you may not be able to use that outdoor shower for a while, fire pits and outdoor fireplaces are a great way to enjoy the beauty of this season. They make it easy to enjoy the perfect balance between the sweltering heat of summer and the bitter cold of winter. Whether entertaining family and friends or just enjoying the peace and solitude of your own backyard, these fire pits and outdoor fireplaces can keep you warm and toasty. Sunken pits are also popular. “A sunken terrace area with a fire pit offers shelter and protection from the elements – and also creates a unique and cozy space to huddle up,” Flaxman says. This sunken patio with a fire pit has acid etching to create a nonslip surface. According to Austin Alvarez, who, along with his wife, blogs about his DIY projects at Building Our Rez, you can also build your own DIY fire pit from scratch for less than $75. “Simply clear the ground cover or grass, spread paver base, lay your concrete blocks and fill the center with pea pebbles,” Alvarez says. The photo above is the fire pit he built himself. If you need detailed instructions, Michael Provenzano, marketing manager of adhesives and sealants at PPG (makers of LIQUID NAILS® adhesives), offers more. Choose an area at least 25 feet from your home. This should be an area with no trees nearby and no overhanging branches. Provenzano says it’s also a good idea to research the fire regulations in your area. 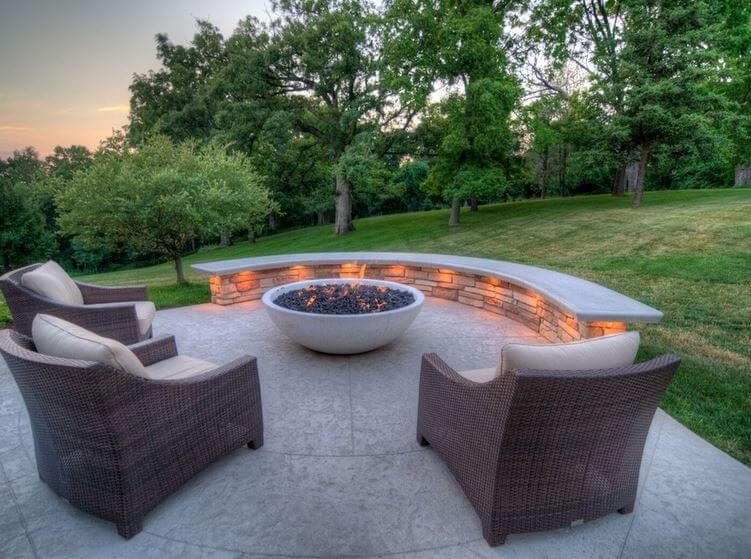 Measure the area you want to use for the fire pit. Depending on the condition of the area, it may be necessary to create a sand bed or remove the soil’s top level. If the latter, be sure to contact your local utility company before you start digging. That way, you won’t unintentionally hit any underground utility lines. Lay blocks in your desired style, placing a 1/4-inch continuous line (bead) of LIQUID NAILS FUZE*IT® All Surface Construction Adhesive roughly 1.5 inches from the front and back edges of the blocks. Install a metal insert to ensure the adhesive does not come into contact with the open flame. Wait at least 24 hours for the adhesive to cure before using any new fire pits. If you want a larger, more permanent source of outdoor heat, consider building a fireplace to create warmth and beauty. Whereas fire pits have a low profile, fireplaces can be built to any height. As a result, they can provide privacy and add architectural detail to the exterior of your home. No gas or electricity is needed. Lasky says the cartridges last anywhere from 2 hours to 2.5 hours, similar to a real log, but without the smoke. To avoid excess smoke inhalation while sitting around a fire, burn only dry material and use vents to direct the smoke upwards, not outwards. “Logs or sticks that are damp will increase the amount of smoke when burned.” Hoff explains that excess smoke inhalation can irritate the eyes, nose and throat. Some people may also experience breathing issues or nausea. Keep several buckets of water or sand or a fire extinguisher nearby in case of an emergency. “If you prefer a fire extinguisher, be sure to the read the directions for your specific model and understand how to properly use it should an emergency occur,” Hoff says. The post Fire Pits and Outdoor Fireplaces to Keep You Warm and Toasty in the Fall appeared first on Freshome.com.